is it OK to medicate your puppy? When it comes to respecting their masters’ psychological and physical needs to sleep well past sunrise, puppies frankly don’t give a damn. Because they don’t consider it as important as hip dysplasia or cardiomyopathy, breeders don’t make this otherwise important disclosure when you’re out looking to add a dog to your life. It is only when you welcome the puppy home and spend several months with your new friend that you discover this. (This assumes that your puppy is going to sleep in your bedroom and not in the garage where you’ve installed a doggie door). If your puppy’s somewhere in the close vicinity of your bed, you will discover that sleeping in is no longer part of your life. This discovery process requires a couple of months. Once the puppy’s home, it’s just like raising a human infant. The early days are marked by frequent nightly wakeups. Your puppy’s got to go and you’re the one who has to get up and let her out. You immediately start dreaming of the day when your puppy will sleep through the night. With the passage of weeks, she will, indeed, sleep more. You’ll find yourself getting more sleep. You’ll think that things will continue to improve. They will. Your puppy will sleep longer shifts. Now you’re only getting up once a night. Maybe at 3:30 am. Things are looking up. The puppy grows. Her bladder capacity increases. Suddenly, you’re up to 6-7 hours, maybe even eight. That’s good, but just not good enough. You’re hoping for more. A few more months pass but the hours aren’t stretching out enough. A version of diminishing returns kicks in. One day, you wake up and realize that the math just isn’t going to tilt far enough in your favor. You’re suddenly hit with the realization that your puppy has a ceiling on undisturbed sleep. The sad realization is that her ceiling is not your ceiling. Your ceiling is higher. You can sleep for longer stretches than your dog. She might be able to sleep an aggregate of 17-20 hours a day but they come as chapters in her daily life. 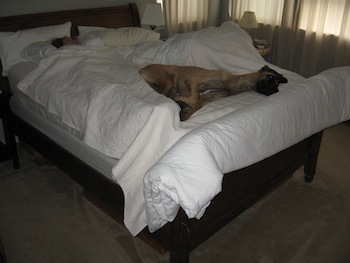 Our Great Dane puppy Luna will never sleep enough at night to provide us with the luxury of a late-morning wake up. It’s one of the realizations now that Luna’s passed the eight-month line. She’s as incapable of sleeping more than 8-9 hours at night as she was the night we brought her home. Are we condemned to waking every morning well before 7:00 am as if it is a Sisyphean penalty. (I’m not including OD among the “cursed and wretched” because she’s across the hall and has the option of closing her bedroom door). Several months ago, I started fantasizing about just how nice it would be to have just one early-morning dream reach an interrupted conclusion. How about a little pharmacology? Cutting to the chase, is it OK to medicate your puppy? What about a little pill or sedative powder that you could add to your dog’s evening meal or water that would guarantee 12 hours of repose? No side effects other than blissfully uninterrupted sleep. Apparently, it is the only way we’re ever going to see the far side of 7:00 am while asleep. That’s my waking dream. To sleep in. What say you? Think it would be OK to slip your puppy/dog a little something so you could sleep in next Sunday morning? I know there’s consumer demand. I’d be first in line to buy in bulk.